Google Nexus 4 by LG is official | What Hi-Fi? The Nexus 4 smartphone is official, becoming the latest member of the Google Nexus family. Designed collaboratively by LG and Google, the Nexus 4 UK release date has been confirmed for November 13th. The Nexus 4 has a 4.7in, 1280 x 768 resolution screen, is available in 8GB and 16GB versions and will run the Android 4.2 Jelly Bean OS. Google had been set to announced the Nexus 4 at an event in New York today but the event was cancelled due to Hurricane Sandy. Also inside the Nexus 4 is an 8MP front camera and 1.3MP rear cam, 2GB RAM, wireless charging, NFC technology and support for HSPA+ – but no sign of 4G. Nexus 4 comes with the latest version of Google Now, Google Maps for Android with turn-by-turn GPS navigation, live traffic info, and integrated driving, walking and transport directions. The Nexus 4 will be sold unlocked via Google Play from November 13th in a number of territories, including the UK. 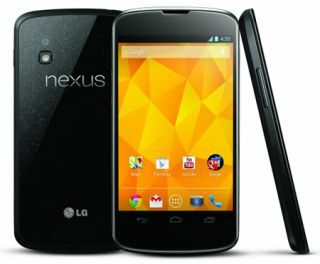 Carphone Warehouse has leaked the next Nexus phone, the Google Nexus 4, ahead of the Google press event on Monday. The Nexus 4, manufactured by LG, will feature a 4.7in screen with a resolution of 1080 x 768. It will support NFC and feature a quadcore processor, as well as an 8MP camera. As with all flagship Google products, it will ship with Android 4.2 Jellybean. It's expected to have just 8GB of storage. It can be preordered from £31 on O2 and Vodafone, and could be available as soon as October 30. That’s just one day after Google is expected to unveil the Nexus 4 officially. We’ll be covering the event on Monday so stay tuned for full details on the Nexus 4 from Google and LG, and to see what other surprises Google has up its sleeves.